It feels like I’ve been a testing fool the last 2-3 weeks, and that is the absolute truth! Now that these are released, I’m going to crawl back in my hole for a few weeks to recover. These pants caught my eye in their very first preview, and I’m grateful for my first opportunity to test for Jessica over at 5 out of 4. These pants fulfilled a specific goal that I set late last year. Outside of sewing, 2017 is my year to conquer solo hiking, backpacking, and camping. I’ve been doing short (1-2 mile) hikes with James most weekends, and longer (5-10 mile) hikes on my own when time permits. I really want to sew a small Adventuring Capsule including jackets, pants, shorts, tops, bras, and undies specifically using outdoor and athletic appropriate fabrics (which now make up a significant portion of my stash). To that end, I ordered samples of just about every fleece and athletic fabric offered by Rockywoods, and the PolarTec Power Shield was my instant favorite. It’s an upgraded softshell fabric with a wind and water resistant “hard face” and a wicking, breathable fleece inner layer. At $28/yard it is out of my budget for experimenting and fabric-hog projects. Luckily, I saw WindPro come up in a destash for $8/ yd (!) – this is a very similar hard face/ fleece lined fabric often used for diapers and mama cloths, and I was able to pick up 6 yards total in 3 different colors. I was thrilled when it came in, and knew it would make spectacular pants and jackets for myself and my son. Pictures taken 10 minutes apart, and I moved the water around a bit. A little of the misted water absorbed when I rubbed it in, but the fleece interior remained completely dry! The testing process for these pants went through 6 versions in just over a week- Jessica worked hard to make sure the seat seams were as good as they could be, and included a tutorial for achieving a more individual fit. I made 2 fit-check muslins using heavier weight supplex from Zenith and Quasar before I felt ready to dive into the good stuff with all the pockets and options. When it was all said and done, the only adjustment I needed to make the pattern fit me perfectly was to take out 2 1/2″ in length to fit my short legs. I made the mid-rise version to ensure they would stay up with vigorous walking, and used lighter supplex to line the front and back waist to reduce bulk. They are completely comfortable, and SO warm and cozy. I’ll be taking them for a test drive on the trails this coming weekend. The WindPro has just the right amount of stretch to keep these snug where I want them, and really good body so the pants look and feel structured. In thinner fabrics like supplex (that are still heavy weight as far as knits go), they still look really sharp and feel like higher end yoga pants. The top I’m wearing is the Lille Racerback from Greenstyle Creations, made in a botanical print brushed poly also from Zenith & Quasar. The binding is the same lighter supplex I used on my pants waist lining. I probably could have left 1″ or so more on the inseam, but at least these won’t be getting too muddy on the trails. Future hack ideas for me include adding drawstrings to the outseams and hems to add controls for length and tightness. 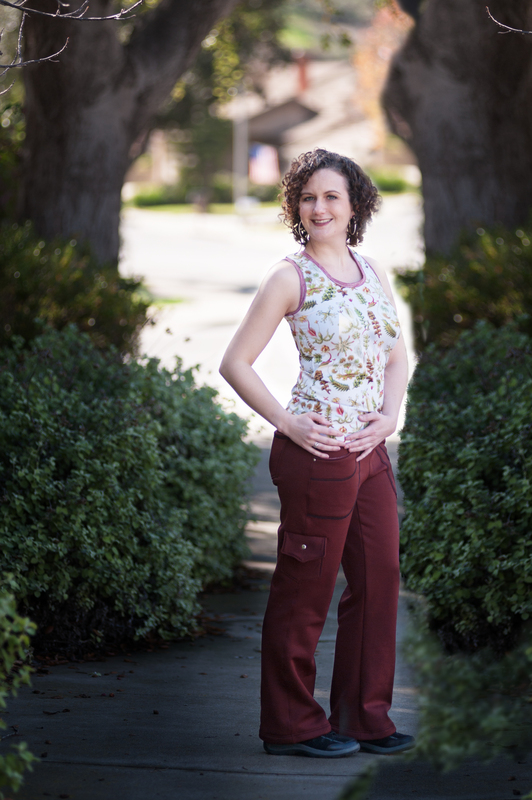 If you’re looking for a versatile knit pants pattern than can take you through everything you might need to do in a day, these are it! Pick up your copy of the pattern here! Those look heavenly! Definitely giving this pattern a try! Thanks for sharing!